This is a spot where I could cuddle up with a hot tea, sweet nibble, good book and a warm blanket to spend a lazy afternoon. I could literally do that at Creemore Kitchen, as cozy blankets are part of the chilly season’s décor, and meant to be snuggled with. 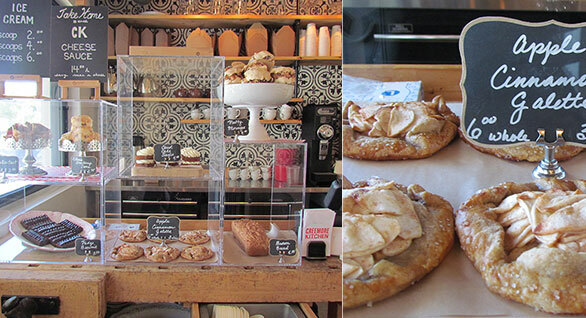 Creemore Kitchen serves lunch, dinner, weekend brunch and gorgeous sweets in the attached bake shop. In warmer seasons a covered patio is available. Four partners entered into this business; two are partners in life. Sam Holwell and Caesar Guinto have an eye for detail, creative skills to mix mediums, be it restaurant décor or food on the plates. Their approach to food is in synch with my own; they support local, and have cultivated successful relationships with the farmers and growers who provide them with the fabulous raw materials from which Chef Caesar lovingly crafts the food on the menu. This is farm to table at its best. Relationships matter, community involvement is strong. On my second visit the restaurant was charmingly decorated for Halloween, with Sam and Caesar planning on hosting an open house for the neighbours, providing themed drinks for the adults, sweets for the kids, with all staff in costume. Chef Caesar is classically French trained and highly skilled at melding his many influences with the unique flavours of his Philippine background. It is clear that extraordinary thought, planning and sourcing occurred, given the unique design items that set the stage for the comfort of guests. A gorgeous oversized chandelier centers the space, industrial style mingles with classic; tea towel napkins, index card signage, simple, classic lined notebook paper menus. Old style glass jugs host sprays of teasel and dried seed pods, a collection of stately candlesticks stand guard on the bar, even the music fits. 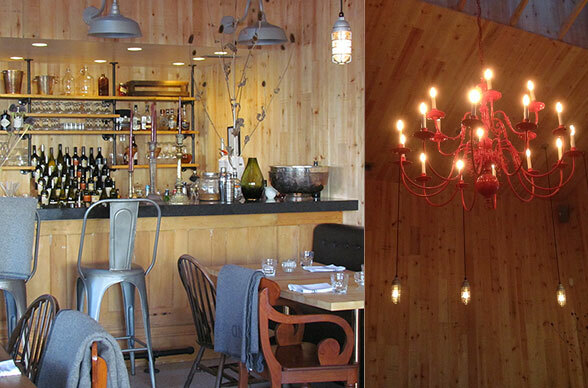 There is no pretense here; the design is casual elegance, which echo’s the menu. Comfort food was on my mind that evening and I chose to order the “Crispy Pork Belly with Celery Root Puree and Apple Raisin Slaw” starter. Beautifully presented, the fresh crunch of the slaw balanced the smooth salty pork belly. This was flavour. I moved on to the “Fried Chicken with Biscuit, White Thyme Gravy, Potato Puree and Carrot Slaw”. I wanted to eat with my hands! Dining companion du jour also stuck to the comfort food theme and ordered the burger. Her only complaint, it was so juicy, so well sized, it was a challenge to keep firmly held in her hands! For dessert, the “Chocolate Pave with Plum Compote, Crème Fraiche and Sable”, (precious rich cookies) was amazing. Table next allowed me to photograph their “Apple Fritter with Caramel and Vanilla Ice Cream”, as this is a menu favourite. Donuts are a Saturday bakeshop feature and I suspect I will be driving forth to try some! My second trip out was for lunch and the opportunity to interview partners Sam and Caesar. I enjoyed a flavourful bowl of mushroom soup, choosing to save room for afternoon tea, having spotted in the bake shop a long time favourite, “Nutty Meringue’s”, (which were previously offered at another Barrie establishment), made with Chef Caesar’s recipe of course! On Chef Caesar’s suggestion I took the meringue home with me, softly crumbled it, gently mixed in some organic whipped cream, and devoured it. This wonderful treat is known as “Eton mess”, a traditional English dessert served at Eton College’s annual cricket match. I have the utmost respect for those who grow the food I eat, for those that take the raw ingredients and create tempting foods, both sweet and savory. To me this honours the land, the community, the economy, and it benefits us all. 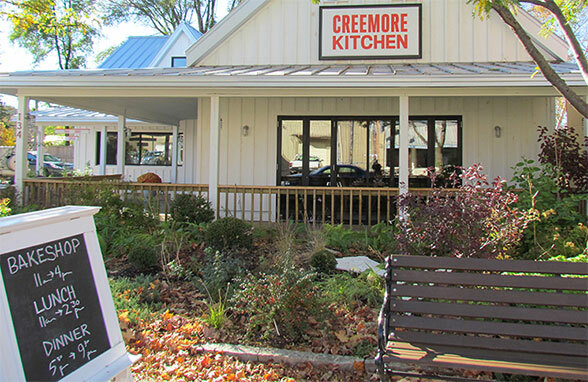 Thank you Creemore Kitchen!